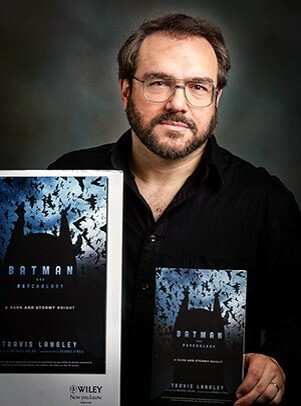 Travis Langley, the acclaimed author of the book Batman and Psychology: A Dark and Stormy Knight will take part in several talks at Illinois State University and the Normal Theater on September 14 and 15. All events are free and open to the public. Langley is a professor of psychology at Henderson State University in Arkansas, and studies and lectures on the psychology behind popular culture. He is the editor of many books in the Popular Culture Psychology series by Sterling Publishers, including those that delve into Wonder Woman, Star Wars, The Walking Dead, and Game of Thrones. The events are sponsored in part by Illinois State University’s Department of Psychology, Institute for Prospective Cognition, Psi Chi student organization, the Harold K. Sage Fund, and the Illinois State University Foundation. The event is part of the Heroes Rising series from the Department of Psychology. For additional information on the events, contact the Department of Psychology at (309) 438-8687.